Description: See multi media environments and combined projects. Description: A few parents came in to help the students and have snacks too. The students had no problem talking about the color logic or pattern logic they were using. They helped their parents flow in with the process. Description: The banners create a window feel. Description: This tree project was a NESI program. Again the reading, the study of the Acacia tree and the seeds, the flowers and the branches. The special type of leaves. The patterns within the leaves and to describe the trunk. Description: Seasons of life and seasons of learning. Description: Roots and Branches through the seasons. Description: This program was very involved. This is only one project of many the school created through Arts @ Large programming. 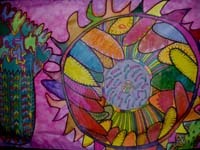 The designs were by the second and third graders and the middle school students created the patterns and color. Description: Each grade level through 5th grade particpated in the program helping with both the group projects and their individual projects. Each child made 2 individual projects--one to keep and one to give away at the celebration. Kwanzaa!! Description: The students loved this project---so many different tactile experiences and so many choices of things to do. Description: The middle school students helped with making the celebration a beautiful closure to a high energy program. The banners measured 4' wide by 8' high. Description: The fifth graders worked on mask designs for the banners and papier mache and mosaic masks. Description: The students created individual projects alongside the 7 banners and 6 masks. 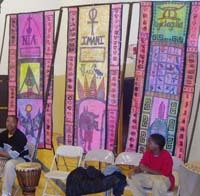 Description: The school focus for the program was the seven principles of Kwanzaa. The students had their grade level studies in various African countries. Description: Students worked with designing different thickness of stems, cooridinating the designs on the blades of grass, figuring the color and design for the petals. It is a lot of thinking and looking at the whole work. 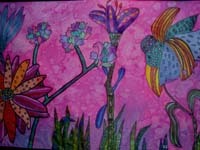 Description: A perfect way to explore color and the different mediums and their effect on color. Description: A good group problem solving project. A good project for students to focus on. All 4 banners were created in 2 days. 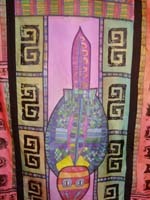 Description: The students enjoy the intricate designing and patterning on the banners. Description: Every student made several preliminary drawings. Notice the grade levels: 5th grade has a strong realism while the 3rd grade drawings are just fantastically imaginative. Description: This narrow format is perfect for the younger students--they can reach across the banner and the horizontal position keeps the images small enough for the students to visualize. 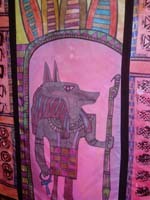 Description: This is a close up of the banner. The students made (4) banners measuring 2 1/2' h. x 8'l.